Here are some snazzy birthday facts about 9th of June 1975 that no one tells you about. Don’t wait a minute longer and jump in using the content links below. Average read time of 10 minutes. Enjoy! What day was my birthday Jun 9, 1975? June 9, 1975 was a Monday and it was the 160th day of the year 1975. It was the 23rd Monday of that year. The next time you can reuse your old 1975 calendar will be in 2025. Both calendars will be exactly the same! This is assuming you are not interested in the dates for Easter and other irregular holidays that are based on a lunisolar calendar. What day is June 9 this year? There are 49 days left before your next birthday. You will be 44 years old when that day comes. There have been 16,022 days from the day you were born up to today. If you’ve been sleeping 8 hours daily since birth, then you have slept a total of 5,341 days or 14.62 years. You spent 33% of your life sleeping. Since night and day always follow each other, there were precisely 543 full moons after you were born up to this day. How many of them did you see? The next full moon that you can see will be on May 18 at 21:13:00 GMT – Saturday. Fun stat: Your first one billion seconds (1,000,000,000) happened sometime on February 15, 2007. If a dog named Armanii - a Irish Terrier breed, was born on the same date as you then it will be 213 dog years old today. A dog’s first human year is equal to 15 dog years. Dogs age differently depending on breed and size. When you reach the age of 6 Armanii will be 42 dog years old. From that point forward a medium-sized dog like Armanii will age 4.5 dog years for every human year. View the complete list of June 9 celebrity birthdays. Who are the famous June 9 birthdays? Here’s a short list of famous people in history who were born on Jun 9. View the complete list of June 9 famous birthdays. 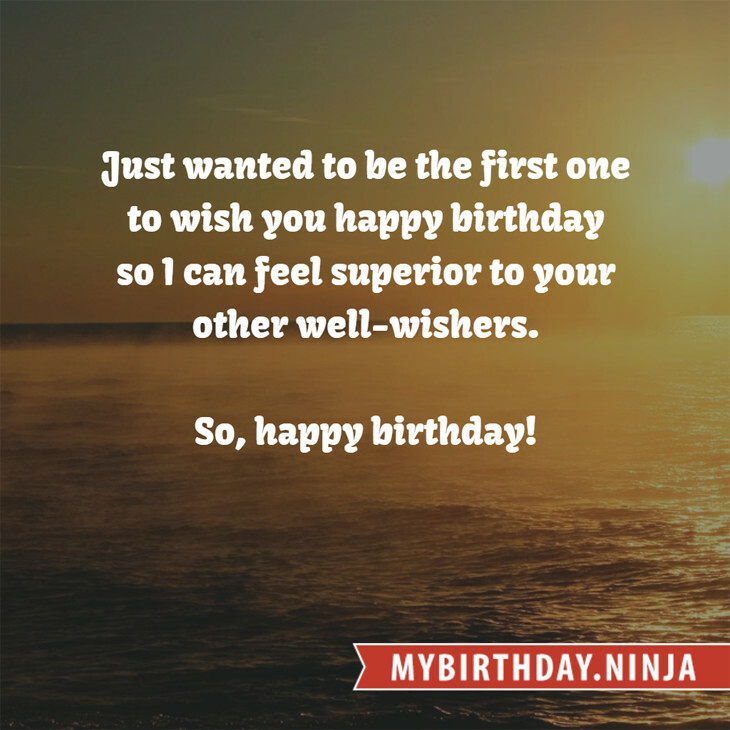 What happened on my birthday – Jun 9th? Odo of Aquitaine defeats the Moors in the Battle of Toulouse. Second Anglo-Dutch War: The Raid on the Medway by the Dutch fleet begins. It lasts for five days and results in the worst ever defeat of the Royal Navy. American Civil War: Battle of Brandy Station, Virginia. Treaty of Tientsin is signed to end the Sino-French War, with China eventually giving up Tonkin and Annam – most of present-day Vietnam – to France. Charles Kingsford Smith completes the first trans-Pacific flight in a Fokker Trimotor monoplane, the Southern Cross. Donald Duck makes his debut in The Wise Little Hen. Six-Day War: Israel captures the Golan Heights from Syria. The 60th Anniversary Celebrations of Bhumibol Adulyadej’s Accession. An explosion kills 17 people and injures at least 46 at a hotel in Peshawar, Pakistan. View the complete list of June 9 historical events. What does my birthday June 9, 1975 mean? Your birthday numbers 6, 9, and 1975 reveal that your Life Path number is 1. It represents initiative, potential and singularity. You are a born leader. You insist on your right to make up your own mind; you demand freedom of thought and action. The following celebrities also have the same life path number: Demián Bichir, Albert Millaire, Caroline Ellis, Saffron Henderson, Jim Peterik, Warwick Capper, Snakefinger, Kevin Michael Richardson, Orianthi, Beth Allen. 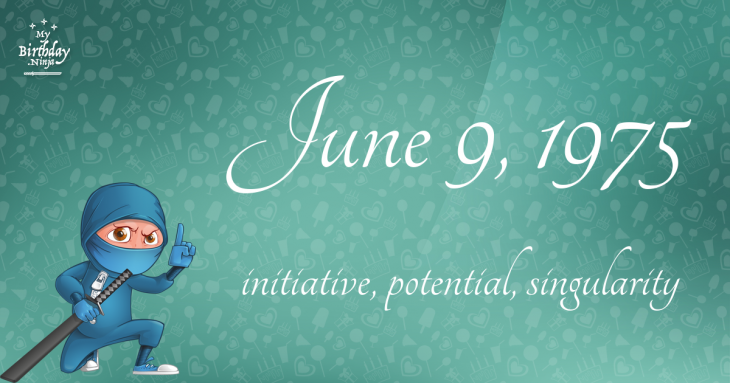 What is the birthday horoscope for Jun 9, 1975? The Western zodiac or sun sign of a person born on June 9 is Gemini ♊ (The Twins) – a mutable sign with Air as Western element. The ruling planet is Mercury – the planet of communication. According to the ancient art of Chinese astrology (or Eastern zodiac), Rabbit is the mythical animal and Wood is the Eastern element of a person born on June 9, 1975. What is the birthstone for June 9? Fun fact: The birth flower for 9th June 1975 is Rose for devotion. What is the Love Match for Jun 9, 1975? When it comes to love and relationship, you are most compatible with a person born on August 4, 1955. You have a Love Match compatibility score of +221. Imagine being in love with your soul mate. On the negative side, you are most incompatible with a person born on January 8, 1990. Your incompatibility score is -190. You’ll be like a cat and a dog on a love-hate relationship. Arf-arf, I want to bite you. Meow-meow, stay away from me! What is a good birthday trivia for June 9? The number-one hit song in the U.S. at the day of your birth was Sister Golden Hair by America as compiled by Billboard Hot 100 (June 14, 1975). Ask your parents if they know this popular song. I do not know how you feel about this, but you were a female ♀ in your last earthly incarnation. You were born somewhere around the territory of Yukon approximately on 1200. Your profession was philosopher, thinker. How many babies were born on June 9, 1975? Base on the data published by the United Nations Population Division, an estimated 121,558,022 babies were born throughout the world in the year 1975. The estimated number of babies born on 9th June 1975 is 333,036. That’s equivalent to 231 babies every minute. Try to imagine if all of them are crying at the same time. What is the popular baby name on 9 Jun 1975? What’s your bizarre Florida Man story? The #FloridaManChallenge is breaking the Internet and social media. Some crazy men, women, or creatures from the Sunshine State are making headlines every day of the year including your birthday. Try this fun exercise. Pick your search engine of choice and type in “florida man June 9” and see what kind of wild news headline you will get. This viral craze started in 2013 and gets resurrected now and then. The latest was from Tumblr and found its way to Twitter. As they say, the rest is history. Here’s a quick list of all the fun birthday facts about June 9, 1975. Celebrities, famous birthdays, historical events, and past life were excluded. Try another birth date of someone you know or try the birthday of these celebrities: November 20, 1925 – Kaye Ballard, American actress and singer; January 28, 1952 – Tomokazu Miura, Japanese actor (RC Succession); October 24, 1947 – Kevin Kline, American actor and singer.